It’s been 10 years since Michael Wigler had a breakthrough revelation in autism genetics — one that arguably launched the field as we know it. The discovery fast led to further advances. Focusing primarily on de novo mutations, three teams of scientists, including one led by Wigler, began hunting for genes that contribute to autism. Their approach was efficient: Rather than looking at the entire genome, they scoured the 2 percent that encodes proteins, called the exome. And they looked specifically at simplex families, which have a single child with autism and unaffected parents and siblings. The premise was that comparing the exomes of the family members might expose de novo mutations in the child with autism. The approach yielded a bumper crop: Based on data from more than 600 families, the teams together predicted that there are hundreds of autism genes. They identified six as leading candidates. Some of the genes identified at the time — CHD8, DYRK1A, SCN2A — quickly became hot areas of research. In 2014, the number of strong candidates jumped higher. In two massive studies analyzing the sequences of more than 20,000 people, researchers linked 50 genes to autism with high confidence. Wigler’s team looked at simplex families and found rare de novo mutations in 27 genes. In the second study, researchers screened for both inherited and de novo mutations and implicated 33 genes. The two studies identified 10 genes in common. This is just the start, however. As scientists enter the next chapter of autism genetics, they are figuring out how to build on what they have learned, using better sequencing tools and statistics, bigger datasets and more robust models. For example, they are looking for common variants — which are found in more than 1 percent of the population but may contribute to autism when inherited en masse. And they are also starting to look beyond the exome to the remaining 98 percent of the genome they have largely neglected thus far. “Most of the genetic advances fall into a category of large-effect-size de novo variants, which is only one piece of the puzzle,” says Daniel Geschwind, professor of human genetics at the University of California, Los Angeles. It’s an important piece, but one that still cannot explain why autism clusters in families, for instance, or why close relatives of people with autism often share some of the condition’s traits. So how much of autism’s genetic architecture have scientists uncovered? Current estimates suggest that rare mutations, whether de novo or inherited, contribute to the condition somewhere between 10 and 30 percent of the time. Before the recent spate of discoveries, the proportion of individuals whose autism had a known genetic cause was only 2 to 3 percent — much of that from rare related genetic syndromes, such as fragile X syndrome and tuberous sclerosis complex, which stem from mutations in a single known gene. These syndromes often involve some core features of autism, along with their own set of characteristic traits, and intellectual disability. Instead, much of the risk in these instances likely comes from common variants, which have small effects on their own, but can add up to increase overall risk. Researchers have tried to identify those relevant to autism using genome-wide association studies (GWAS), which compare the genomes of people with and without a condition to find differences in single-letter swaps of DNA called single nucleotide polymorphisms. Because common variants have small effects individually, they are difficult to find, but multiple studies suggest that they play a major role in autism risk. In a 2014 study, for instance, researchers used statistical tools to estimate the heritability of autism from the amount of common variation shared by unrelated people with autism. They applied the method to data from more than 3,000 people in Sweden’s national health registry. Their calculations indicated that common variants account for 49 percent of the risk for autism in the general population; rare variants, equal parts de novo and inherited, explain 6 percent. Some scientists dispute these figures, but it’s clear that common variants, rare inherited variants and spontaneous mutations all play a part in autism. Wigler says he is skeptical of using GWAS studies for autism precisely because they focus on common variants. “Most of the disorders that will cause pain and suffering and require expensive treatments, if they’re genetic, are caused by rare variants that are not going to stay around in the population,” he says. Common variants may turn out to be more relevant at the milder end of the spectrum than in those who are severely affected. “The people who have de novo mutations, en masse, tend to have lower intelligence quotients and more cognitive problems,” Sanders says. Researchers are grappling with how to fit these pieces together: Finding and diagnosing rare variants linked to severe outcomes is important, but so is unraveling how the core traits of autism relate to other psychiatric conditions and manifest in the general population. “Both goals are important, and they shouldn’t be seen as at odds with each other,” Daly says. In fact, a study published in May reported that rare and common variants can combine to increase an individual’s risk. The landscape of autism genetics becomes even more complex when considering the sheer number of genes that could be involved — some researchers estimate up to a thousand — and the fact that many high-confidence autism genes are also associated with other conditions, ranging from intellectual disability and epilepsy to schizophrenia and congenital heart disease. This ‘many-to-one’ and ‘one-to-many’ relationship is not surprising, Sanders says. But it does mean there are probably no unique ‘autism genes’ per se. “But I could flip that round and say we’ve not found anything which is a pure intellectual disability or schizophrenia gene [either]; on a fundamental level, these disorders seem to be related,” he says. “If I was to say, ‘Can we find something which contributes more to autism than other disorders?’ then I think the answer’s yes.” The genes that seem particularly tied to autism could offer important clues about the condition’s biology. The genes identified so far have hinted at a handful of underlying mechanisms that contribute to autism. Most of them seem to be involved in three broad categories of tasks: maintaining the function of synapses, or the connections between neurons; controlling the expression of genes; and modifying chromatin, structures of DNA wound around protein ‘spools’ called histones. Chromatin determines which stretches of DNA can be read and so influences gene expression. The idea of a brain condition originating with atypical neuronal connections made logical sense from the start. “There had been a lot of interest in the synapse,” Sanders says. But the candidates that control gene expression only emerged in the genetic studies. Two genes that consistently top the ‘high-confidence’ lists — CHD8 and SCN2A — were both somewhat of a surprise. CHD8 encodes a chromatin regulator that controls the expression of thousands of other genes. SCN2A codes for a sodium channel and had primarily been associated with infantile seizures. Using gene expression maps, such as the BrainSpan Atlas, researchers have traced when and where autism genes are active in the brain. They have found that many of the genes, CHD8 and SCN2A included, are expressed in parts of the cortex during mid- to late fetal development — which happens to be the peak period when neurons are forming. “We don’t really understand it yet, but they’re more likely than not to disrupt fetal brain development in mid-gestation,” Geschwind says. That timing suggests they interfere with processes that are critical to setting up the cortex, including which types of cells form and where in the brain they migrate. If the cortex isn’t set up right, he says, you create ongoing problems with how neurons communicate, among other important functions. Within the next few years, he says, researchers will have a refined understanding of the neurons and circuits affected. Work in animal and cell models reveals similar problems with the genesis, structure and fate of new neurons and the connections between them. In some cell and animal models of syndromic forms of autism, scientists have managed to at least partially correct some of these problems with drugs. The unrealized promise of these findings is that some traits of autism may ultimately prove reversible, even in adults. “The idea that there’s something plastic here, not set in stone at birth, is very important,” says Matthew State, chair of psychiatry at the University of California, San Francisco, and lead investigator on many of the big autism genetics studies. In the meantime, genetic discoveries have delivered some immediate benefits for people with the condition. “If you go into a clinic today, there’s about a 10 percent chance of you getting a genetic diagnosis, and I would expect to find evidence which was suggestive in about another 5 to 10 percent,” Sanders says. “We can’t then turn round and say, ‘Here’s your cure,’ but what we can do, at least, is put people in touch with other people with that same mutation.” Becoming part of such a group gives people a better idea about what the future holds for them and provides them with support and understanding. Advocacy groups can lobby researchers and funding bodies, contribute to research on their condition and help find participants for clinical trials — which, by grouping people according to their underlying genetics, would then have a greater chance of success. “It becomes very empowering,” says Joseph Buxbaum, director of the Seaver Autism Center for Research and Treatment in New York. Genetic diagnoses can also help families make decisions about family planning and treatment options. For example, deletion of a region on chromosome 17, called 17q12, is associated with autism and schizophrenia, but treating someone who has this CNV with certain mood stabilizers or antipsychotics could be dangerous: It is also associated with renal failure and adult-onset diabetes, which the drugs would exacerbate. What’s more, certain mutations increase the risk for some types of cancer. “Knowing those mutations can be very helpful in those cases, not just in treating autism, but in treating the patient more broadly,” Geschwind says. In March, researchers in Canada reported results from the largest set of whole genomes of people with autism to date. They sequenced the whole genomes of more than 5,000 individuals, about half of whom have autism. Among the 61 variants the researchers identified, 18 had not been firmly linked to autism before. The team found that many of the CNVs in people with autism rest in noncoding regions. Some teams are applying other resources, such as gene co-expression maps and protein-protein interaction networks, to understanding the underlying biology of the condition. These networks are only likely to become more powerful as researchers uncover more risk genes for autism. “The question is how to integrate all that genetic data with other ‘-omics’ data, and network-type approaches are probably going to be critical there,” Geschwind says. 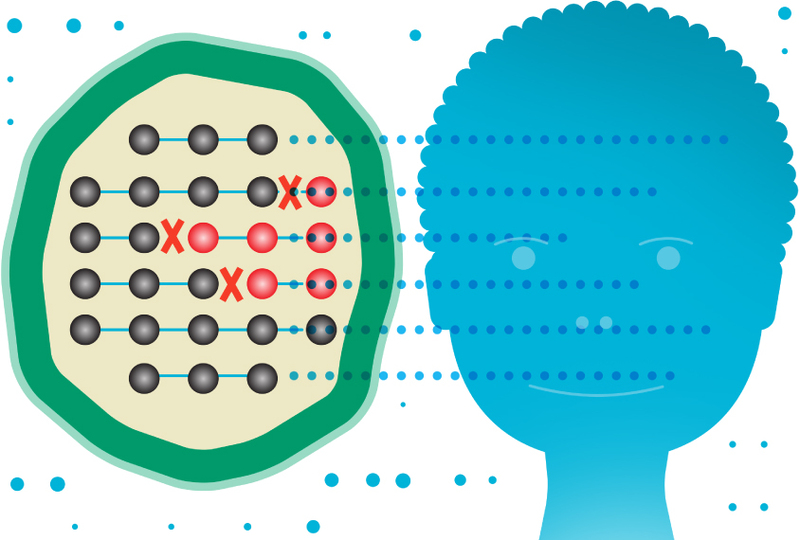 Most autism research arising from gene discovery is focused on repercussions at the molecular and cellular levels, but there’s an important gap from there to whole circuits and behavior. “Ultimately, the value of genetics is very likely to play out through an improved understanding of circuit-level function and anatomy,” State says. Stem cells and emerging technologies such as brain organoids — so called ‘mini-brains’ in a dish — could afford researchers a prime opportunity to study the effects of genetic variation in human neurons. Faced with the limitations of mouse models in studying a condition characterized by behavioral problems, some teams are also turning to monkeys, which enable them to study more complex social interactions. “Something we should be doing for the future is taking the precise mutations we find in humans and making those in primates,” Wigler says.